The HWE domain is found in a subset of two-component system kinases, belonging to the same superfamily as (PUBMED:14702314). In (PUBMED:14702314), the HWE family was defined by the presence of conserved a H residue and a WXE motifs and was limited to members of the proteobacteria. However, many homologues of this domain are lack the WXE motif. Furthermore, homologues are found in a wide range of Gram-positive and Gram-negative bacteria as well as in several archaea. Two-component signal transduction systems enable bacteria to sense, respond, and adapt to a wide range of environments, stressors, and growth conditions [(PUBMED:16176121)]. Some bacteria can contain up to as many as 200 two-component systems that need tight regulation to prevent unwanted cross-talk [(PUBMED:18076326)]. These pathways have been adapted to response to a wide variety of stimuli, including nutrients, cellular redox state, changes in osmolarity, quorum signals, antibiotics, and more [(PUBMED:12372152)]. Two-component systems are comprised of a sensor histidine kinase (HK) and its cognate response regulator (RR) [(PUBMED:10966457)]. The HK catalyses its own auto-phosphorylation followed by the transfer of the phosphoryl group to the receiver domain on RR; phosphorylation of the RR usually activates an attached output domain, which can then effect changes in cellular physiology, often by regulating gene expression. Some HK are bifunctional, catalysing both the phosphorylation and dephosphorylation of their cognate RR. The input stimuli can regulate either the kinase or phosphatase activity of the bifunctional HK. A variant of the two-component system is the phospho-relay system. Here a hybrid HK auto-phosphorylates and then transfers the phosphoryl group to an internal receiver domain, rather than to a separate RR protein. The phosphoryl group is then shuttled to histidine phosphotransferase (HPT) and subsequently to a terminal RR, which can evoke the desired response [(PUBMED:11934609), (PUBMED:11489844)]. Signal transducing histidine kinases are the key elements in two-component signal transduction systems, which control complex processes such as the initiation of development in microorganisms [(PUBMED:8868347), (PUBMED:11406410)]. Examples of histidine kinases are EnvZ, which plays a central role in osmoregulation [(PUBMED:10426948)], and CheA, which plays a central role in the chemotaxis system [(PUBMED:9989504)]. Histidine kinases usually have an N-terminal ligand-binding domain and a C-terminal kinase domain, but other domains may also be present. The kinase domain is responsible for the autophosphorylation of the histidine with ATP, the phosphotransfer from the kinase to an aspartate of the response regulator, and (with bifunctional enzymes) the phosphotransfer from aspartyl phosphate back to ADP or to water [(PUBMED:11145881)]. 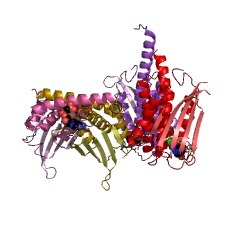 The kinase core has a unique fold, distinct from that of the Ser/Thr/Tyr kinase superfamily. HKs can be roughly divided into two classes: orthodox and hybrid kinases [(PUBMED:8029829), (PUBMED:1482126)]. Most orthodox HKs, typified by the Escherichia coli EnvZ protein, function as periplasmic membrane receptors and have a signal peptide and transmembrane segment(s) that separate the protein into a periplasmic N-terminal sensing domain and a highly conserved cytoplasmic C-terminal kinase core. Members of this family, however, have an integral membrane sensor domain. Not all orthodox kinases are membrane bound, e.g., the nitrogen regulatory kinase NtrB (GlnL) is a soluble cytoplasmic HK [(PUBMED:10966457)]. Hybrid kinases contain multiple phosphodonor and phosphoacceptor sites and use multi-step phospho-relay schemes instead of promoting a single phosphoryl transfer. In addition to the sensor domain and kinase core, they contain a CheY-like receiver domain and a His-containing phosphotransfer (HPt) domain. The HWE domain is found in a subset of two-component system kinases, belonging to the same superfamily as IPR003661 [(PUBMED:14702314)]. In [(PUBMED:14702314)], the HWE family was defined by the presence of conserved a H residue and a WXE motifs and was limited to members of the proteobacteria. However, many homologues of this domain are lack the WXE motif. Furthermore, homologues are found in a wide range of Gram-positive and Gram-negative bacteria as well as in several archaea. There are 9645 HWE_HK domains in 9645 proteins in SMART's nrdb database. Taxonomic distribution of proteins containing HWE_HK domain. This tree includes only several representative species. The complete taxonomic breakdown of all proteins with HWE_HK domain is also avaliable. Click on the protein counts, or double click on taxonomic names to display all proteins containing HWE_HK domain in the selected taxonomic class. The HWE histidine kinases, a new family of bacterial two-component sensorkinases with potentially diverse roles in environmental signaling. Two-component signal transduction pathways play a major role in theresponse of bacteria to external cues. These pathways are initiated bylarge collection of histidine kinases (HKs) containing a sensor domainthat perceives the environmental signal followed by an HK domain thattriggers a histidine-aspartate phosphorelay. Previous phylogeneticanalyses identified 11 major families of two-component HKs by comparingsignature motifs within the HK domain. Here we describe a new family withhomology to Agrobacterium tumefaciens BphP2, an HK first discovered by thepresence of a phytochrome sensor domain involved in light perception.Members of this sensor HK family differ from most others by the absence ofa recognizable F box and the presence of several uniquely conservedresidues, including a histidine in the N box and a tryptophan-X-glutamicacid sequence in the G1 box, which we have used to define the family(HWE). At least 81 members were identified in a variety of alpha- andgamma-proteobacteria, with a significant enrichment in the Rhizobiaceaefamily. Several representatives were shown to have HK activity in vitro,supporting their proposed participation in phosphorelays. One or moredomains related to signal transduction were evident N-terminal to the HKdomain, including chemotactic methyltransferase domains, suggesting thatthis family has multiple roles in environmental signaling. The discoveryof the HWE family further extends the diversity within the HK superfamilyand expands the importance of two-component signaling in bacteria.